The Tennessee 2009 deer season is now in the books. Between holidays, family obligations, and time in the woods and duck blinds, I've been negligent in updating the site lately. Since my last post, I managed to complete a deer trifecta by taking a buck with both muzzleloader and rifle to round out a season that I started with this Pope and Young buck. The buck pictured above was shot at 130 yards with my .270. I had been scouting for a couple hours and had just called my buddy Ted to tell him that I wasn't seeing any tracks or other sign of deer in the woods. I decided to start checking for sign around anything green that I could find. There was a small field nearby with some type of low-growing vegetation that was still green. As I approached the field, I saw a wide set of antlers bobbing along just above the top of some tall dead grass. I threw my rifle up to find the deer in the scope but still could only see antlers. He was on the other side of a small rise which obscured everything from view except the top of his head. He didn't appear to be in a hurry, but he was moving at a steady clip toward the nearby woods. I knew if he didn't show himself in a couple seconds, my chance of getting a shot would vanish. 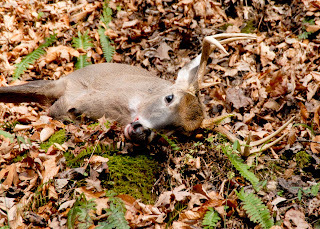 As luck would have it, he rounded the end of the high spot that was hiding him when he was about thirty yards from the cover he was headed toward. I was able to make an offhand shot that dropped him in his tracks. 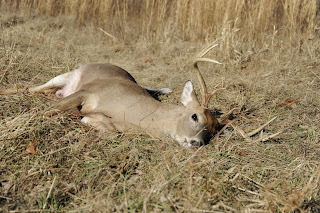 This deer was taken during muzzleloader season. I had spent the morning in my stand overlooking a cedar thicket that bordered a greenfield. This large rub was alongside a major trail leading into the thicket. 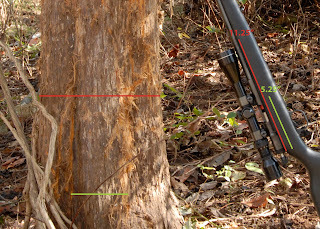 I didn't have anything to measure the tree or rubs at the time I took the picture, but by comparing dimensions on the photo to measurements I later took off my muzzleloader, I had determined that the tree was 11.25 inches in diameter and the parallel sets of gouges were 5.25 inches apart. I measured the distance between brow tines on all my mounts and none of them came close to being 5.25 inches wide. I figured it was either a really big buck making that rub with his brow tines, or else it was a very determined spiker making it with his main beams. I chose to believe the former. While in my stand that morning, I had seen a very large buck follow three does into the thicket but couldn't get comfortable enough with my sight picture to take a shot (I was looking uphill, directly into the rising sun). At about 10:00 I climbed down, took my climbing stand off the tree, and packed up my gear to head out. Almost as an afterthought, I decided to walk up the steep hill and investigate the area where I had seen the deer disappear into the cedar thicket. I'm always interested to see why deer would be travelling a particular route. I clambored up the steep hillside making all sorts of racket in the process. As I approaced the cedar thicket, I heard a deer blow down in the hollow below me and saw a buck cross the creek and pause on the other side, about a hundred yards away. He was looking around and clearly didn't know exactly where I was. I figured it was just a matter of seconds before he started putting some distance between us. I threw my muzzleloader up, squeezed the trigger, and... nothing. I forget to knock the safety off. Dumb mistake, but luckily the deer still hadn't moved. I quickly thumbed the safety and squeezed off the shot. From my vantage point high up the hillside, I could see the buck run along the opposite hillside and drop about a hundred yards away. Turns out he wasn't the bruiser I had seen earlier, but he was a nice buck nevertheless. a little luck dont hurt man! i might have start walking around after i hunt...that's awesome!! !